OH, IT’S HAPPENING! 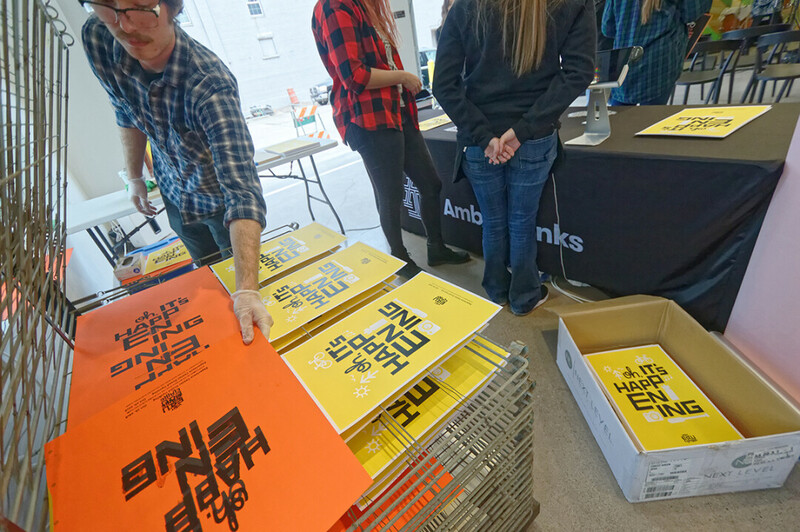 Ambient Inks printed promotional posters during the grand opening of Visit Eau Claire’s Experience Center in October. Throughout its history, Eau Claire has been a lumber town and an industrial town, and more recently a center of medicine, education, and art. Is it a tourist town, too? Increasingly, the answer is “yes.” Eau Claire may be a far cry from the Wisconsin Dells on a summer afternoon – and, frankly, most locals would probably prefer it stayed that way – but visitors and the money they spend are an increasingly important part of our economy. Consider figures released by the Wisconsin Department of Tourism earlier this year: In 2017, visitors spent $257 million in Eau Claire County, a 12.6 percent jump from the previous year. This placed Eau Claire in the state’s top 10 tourism counties, and it was enough to directly support 4,578 full-time jobs with $107 million in wages and salaries. And, according to the state Department of Workforce Development, leisure and hospitality is one of the biggest employment sectors in Eau Claire County – more people work in that category than in manufacturing, construction, financial activities, or public administration. It’s because of this sizable economic impact that tourism is important to all Eau Claire residents – not just those who work in the industry. “Tourism and quality of life factors are foundational to economic development efforts,” said Linda John, executive director of Visit Eau Claire, the region’s destination marketing organization. Visit Eau Claire wants to be seen as a partner in economic development and growth, John said, and this includes playing a role in employee recruitment. To have great careers and businesses, workers and entrepreneurs need to have a great place to live. Visit Eau Claire sees itself as a first stop for people whether they are visiting for a few days or considering relocating here. To that end, Visit Eau Claire recently relocated itself to the heart of Eau Claire’s redeveloping downtown. Visit Eau Claire’s new Experience Center opened this fall in the Pablo Center at the Confluence, the multimillion-dollar public-private arts facility on the banks of the Eau Claire and Chippewa rivers. Emmanuelle added that visitor spending generates additional room taxes which are used by the city to improve amenities such as trails and recreation facilities (which are enjoyed by visitors and residents) and by Visit Eau Claire (to encourage more visitors to come and continue the cycle). Tourist dollars have a broader impact as well. “Perhaps the unseen power of the visitor spending is seen in locally owned shops who through increased shoppers and diners, are in turn better able to take care of their families,” Emmanuelle said. While tourism spending is growing statewide, it’s growing particularly fast locally: In the four years between 2013 and 2017, tourism spending in Eau Claire County grew more than 31 percent, compared with 17 percent statewide. While John said she can’t credit this trend to any one thing, the growing number of large-scale music festivals and other events has certainly helped. Whatever brings people to Eau Claire, Visit Eau Claire wants to be there to meet them. The new Experience Center is meant to offer a taste of the music, art, food, and shopping that visitors will encounter when they go into the wider community. After spending years at their previous location on Jeffers Road on Eau Claire’s north side, John said that relocating meant Visit Eau Claire’s staff “had to prepare ourselves to once again meet the public on a day-to-day basis.” That required changes in the agency’s staffing and budgeting to be ready to engage in person with the public seven days a week. The new space and evolving focus coincide with the creation of two new programs aimed at different kinds of visitors. The first is what Visit Eau Claire is calling a “corporate concierge” service. This service is aimed at helping local employers give great first impressions of the community to potential employees, vendors, and clients. As part of the service, Visit Eau Claire can roll out the proverbial red carpet by arranging tours, offering hospitality, providing a space to show off the city, and even by furnishing gift baskets. Visit Eau Claire has already offered many of these services, but now they will be packaged together, John said. Visit Eau Claire has also launched a series of “Signature Experiences” – a menu that includes art and cooking classes, brewery tours, and even a behind-the-scenes MVP experience at an Eau Claire Express baseball game at Carson Park. These experiences are available for individuals and groups that schedule them in advance. These experiences were designed to give visitors (or even locals) a strong sense of what Eau Claire is all about – just like the new Experience Center itself. “I think this presence is going to make us very relevant to the growing tourism economy,” John said. You can check out Visit Eau Claire’s new Experience Center inside the Pablo Center at the Confluence, 128 Graham Ave., Eau Claire. The center is open 10am-7pm Monday-Saturday and 10am-2pm Sundays.